So last season, in the vast well of confusion, Emily tried to kill Evil Alec and was arrested. Good Alec did kill Evil Alec and now as the sole remaining Alec he is dropping all charges against Emily. That paragraph pretty much sums up how confusing Continuum has become. Carlos would like some quid pro quo for this dropping the charges, but it involves Alec approving something with his company – only Kellog kind of stole the company last season. She wakes up… in 2080, in her own time, apparently after a 3 year coma after the whole execution chamber bomb (when she first went back into the past in season 1). Apparently her CMR kicked in and decided to create a fun little happy story while she was unconscious. Continuum I’m not buying this because the whole “it was all a dream” storyline has long since been an excuse for justifiable homicide for some time now. So Kiera is reunited with her child for lots of tearfulness (and the kid is bizarrely mature). And in comes old Alec praising her for changing the future – and then she wakes up in the 21st century again with Carlos and Young Alec. Ok so the random aside was a way to fill in minutes. Alec takes Kiera home – or to the home that Corporate Evil Alec bought anyway which is now his. Hey he gets all the fancy loot without any of the guilt! Kiera has a new goal though – she has stopped Good Alec creating an evil Dystopian future (which is what future Alec was worried about) and has stopped Liber8 doing whatever naughty shenanigans they were planning on (actually, I think their naughty shenanigans was stopping Alec creating an evil dystopian future too – only they used more bombs to do it). So job’s done- she can now go back home (her non-dystopian and possibly non-existent future where she might not even exist) and see her family (who also may not exist or be her future). And she needs Alec to make that happen. The next day she comes down to find Alex, Emily, Alec’s son Jason (who is older because Time Travel) and ex-Liber8 Lucas (who is on side for reasons I don’t even remember any more and he may even have died a couple of times because this show is confusing) plotting to get the company back off Kellogg. He’s also doing this for Kiera because he cannot possibly get her back to the future without all of his technology back in hands. At said company, Kellogg meets with Curtis (who works for the strange time-travelling quasi-religious sect under some guy called the Traveller because the writers felt that 10 quintillion storylines and faction just weren’t enough) who wants to ally with Kellogg. He also warns Kellogg that his soldiers from the future (Kellogg is the future warlord who leads Brad’s space marines in another grim future) and Curtis can help him manipulate them. Kellogg decides he’s going to wait on that one – Curtis pulls out 8 levels of ominous cryptic warnings in response. She’s now directing Carlos at Kellogg – who, because he now controls Alec’s company pretty much controls the police force. Carlos is kind of limited – now if Kiera does her rule breaking thing, she can bring in evidence with which she can arrest Kellogg. Alec goes to a café to speak to sorta-brother Julian and his followers. He feels out how much Julian knows and tries to recruit him to help him into Pyron and cause more shenanigans. While Lucas contacts Jasmine – who still doesn’t trust Kiera. He warns her that Kellogg is the new source of chaos and badness and there’s something else happening in the future involving Kellogg – and they can’t rely on Kiera because she’s too invested in Brad. So, time for the plan – with Carlos and Kiera gate crashing Kellogg’s party. They try to check what Kellogg knows about anything and he stonewalls constantly. No surprises there. But while they’re doing this, Lucas, Alec, Julian and others do some naughty hacking which shuts down poor Kellogg’s computers. Kellogg pouts mightily. Carlos and Kiera claim all the smug. But Carlos does tell Kiera that she kinda sorta needs to speak to Brad about the Storm Troopers. Kellogg calls Alec and tantrums, firing Julian and then declaring war. Which leaves Alec with a lot less resources connecting to Kiera, a nice flashback to season 1. He also tells Kiera how he mightily screwed over Kellogg with his hack, which Kiera didn’t know about beforehand (really, her plan was for her and Carlos just to attend a party?). Kiera is worried that this war will not help – but all the data that Alec stole is to help get her home and Kellogg is going to be so defensive he won’t even know what the real plan is. She also wants his help to find Brad. To rescue him – not to try and stop his storm troops who shot her. His plan to find them is overheard by Lucas. The space marines have found a base with Brad and their leader, Marcellus, greats him as an old friend (don’t mind the random shooting, that’s how we say hello in the future). He introduces the whole team and tells them they’ve come back in time because everything became even more terribad awful in the future. They’d also quite like why Brad didn’t kill Kiera long with all the other time travellers as he was supposed to. The storm troopers are pulling their suits apart to build something else – which they won’t tell Brad about because he’s no longer on the trust worthy list. Though there is some debate about this – whether to kick him out or tell him all. Kiera goes scouting around looking for Brad and runs into Jasmine – who isn’t happy about Kiera soloing the whole Brad & storm troopers thing. When Kiera finds them, Jasmine insists on coming with her, giving her a little time first. She calls Carlos and has him ready because relying on Jasmine isn’t ideal. Kiera sneaks in invisibly and transfers lots of info to Alex and Jason about the superior technology and items. Kiera overhears that Brad has at least convinced Marcellus he’s part of the team and is safe. She doesn’t leave fast enough before her tech is overwhelmed by the much more fancy tech the soldiers have and we have a firefight. Apparently her going invisible and having an armoured super-suit didn’t clue them in that he has technology to survive the fall. Which she does. Garza provides covering fire and she and Kiera flee. Meanwhile Emily is kidnapped. Just. Whoever these goons are they didn’t seem to know that she’s an amazingly skilled martial artist who does not kidnap easily. Kiera brings Carlos up to speed and he despairs while Kiera is still sure that Brad will come through – and she’s still having lots of insecurities about her future and seeing her kid again. And Curtis meets with Jasmine – he doesn’t want Kellogg to become more powerful so is willing to manipulate Liber8 to do it. As per usual we have no idea which side Curtis and the Traveller are on. Kellogg gets a mysterious delivery – an item with a holographic message inside. I can understand Kiera’s urge to go home, especially after seeing her hallucination child. But she needs to think this through more, or we need to see her thinking this through more. We need to see more of her considering whether she even has a future to return to, let alone what that future looks like. And ignoring Kellogg & Brad’s dystopia is beyond short sighted considering, if it happens in Kellogg’s life time, it’s likely to be something she will one day have to live through (and her son certainly will). Now, her considering all of that and declaring “no, I’m done. I’ve done enough, it’s someone else’s turn to pick up this baton” is an acceptable answer I could respect. But only if she has considered that and isn’t just pretending it isn’t going to happen. 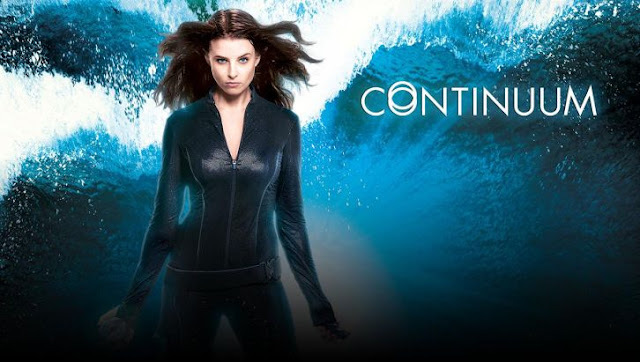 I forgot how utterly confusing Continuum became – so many factions. So many different storylines and groups. And, honestly, I don’t mind because I can kind of keep them all in order – it is working and I even kind of like how many people are involved and how you can never really know what anyone’s motives are because there are so many sides. I do like some complexity, even if I do feel like I’m getting lost, and I like that it isn’t as simple as a good vs evil battle or just two factions – because life is never that neat. I do wonder though, with this being the last season, how Continuum can possibly wrap all of these up in a satisfactory manner?